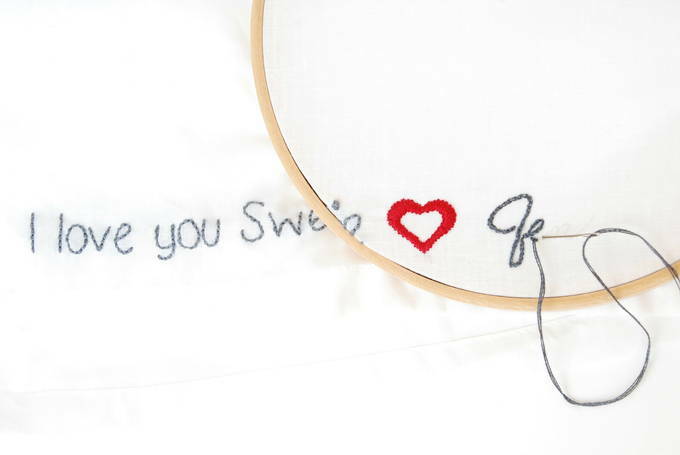 It’s totally unexpected and fun to embroider love messages. When he wears these shorts he’ll be thinking about me all day – that’s for sure. And once you learn how, you’ll want to put your personal touch on other things. Personalized items make great gifts for birthdays, anniversaries, or Valentine’s Day. 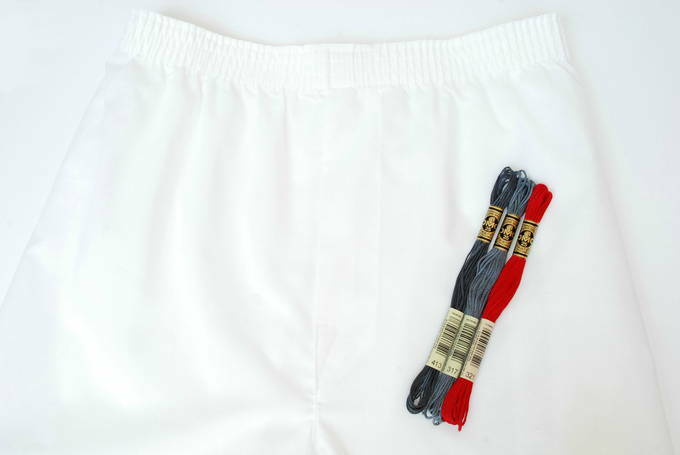 My kids were laughing when they saw me embroidering my husband’s boxer shorts (his underwear). But, why not give him a pair that’s personal, to make him smile (and think of you)? When we were newlyweds, he enjoyed the love notes I sewed into a pair of his boxers then. You could personalize other items in a place that’s hidden – where only he would see it. Try the inside of his hat, inside his suit, or the bottom of a dress shirt. Of course, it can be in a place that’s visible like on a t-shirt. Your message can be simple like mine. Or it could be a wedding vow, a poem, a quote… whatever message that’s special to you. You can include the double heart, use a single one, or draw your own symbol, or none at all. I really liked using my own signature. That made it very personal. He’d recognize that it was my signature a mile away. The message can be entirely written in your handwriting. Or you could choose any font. These stitches are so easy to do. I show you how to make every stitch and the heart in my directions below. It’s fun to embroider a name or love message. You could surprise him by packing it in his luggage for a business trip – so he’ll think of you when he’s gone. Or you could mail it to him with some sweets when he’s out of town. It shows him you’re thinking of him plus, it’ll make him smile.